You don’t have to walk in the desert to find these beautiful plants. Succulent seeds can be found online or at your local plant store. Both cacti and succulents have hit the market as houseplants in the past few years. These seeds can now be found everywhere from commercial seed companies. There are more than 2,000 different species of cacti and succulents that can thrive in your Harborside Village Apartment. These succulents are suitable for both tabletop-potted plants as well as tall floor plants depending on the type of plant you choose. But for those of you without a green thumb, growing a plant from seeds could prove disastrous if you don’t know what you are doing. Let’s take a look at how you can grow these houseplants in your apartment. To successfully grow your succulents, you will need a clean propagation pan. These pans should be no more than four inches deep and six inches in diameter. Start by washing and disinfecting your pan with hot water to get rid of anything that could cause your seeds to die. Once it is clean, it is time to choose your soil or growing medium. When choosing a soil, it is important to make sure the soil will drain well. Look for a porous soil so water will penetrate it easily and drain quickly. If the soil remains wet for long periods of time, it can quickly kill your succulents. 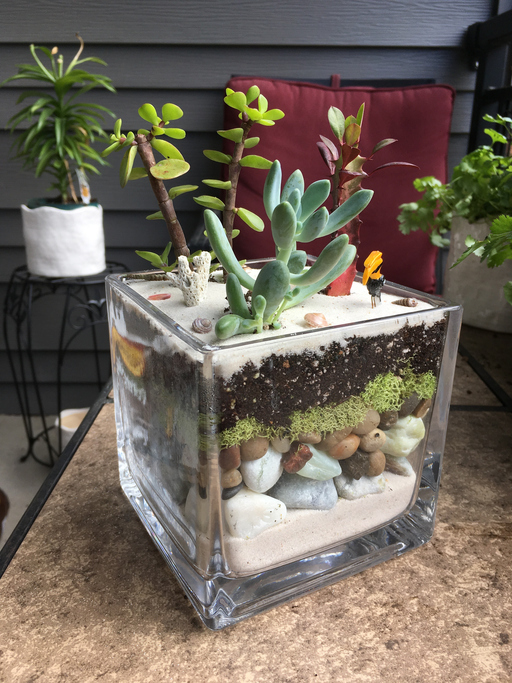 Since there are many different ways to prepare the soil for your succulents, it is important to experiment. One of the best mixtures is two-parts potting soil, one-part perlite, and one-part small gravel like pumice. Mixing these ingredients together will allow your plants to flourish. Whichever soil you choose, put it onto a baking dish and bake it at 300 degrees Fahrenheit for 30 minutes to pasteurize it. Once it is cool, wet thoroughly then let it drain, but not dry. Once drains, fill the propagation pans about a half inch from the rim. Plant the seeds as deep into the soil as they are wide and press down lightly. Cover smaller seeds with a sprinkling of sand and hold them in place. Once all the seeds are planted, cover the pans with clear plastic or a glass and place them in the bright location, but out of direct sunlight. The temperature should be around 70 degrees in the room. If the soil seems too dry, spray it with water lightly but sparingly. Most cacti and succulents will germinate in about three weeks, but some may require more time. When seedling plants appear, raise the cover during the day for ventilation and don’t allow the soil to dry out. It is important not to saturate the soil, though. Most seedlings will be ready to transplant in six months to a year after germination. The right growth size for transplanting will depend on the species. Most succulents can be transplanted when they are two to four inches tall. Gently lift them plants from the growing medium to a new container with fresh soil. Succulents are easy to grow and perfect for your busy apartment lifestyle. For more information on living a great life at Harborside Village Apartments, call us today! This entry was posted on Friday, July 8th, 2016	at 1:53 pm	. Both comments and pings are currently closed.